(Text automatically translated) Dar Zohra is located in a neighborhood of villas, far from the noise of the city, no passage except the few residents. The house is air conditioned and has 2 terraces (one north and one south) that will allow you to sample the Mediterranean siesta. The house has two living rooms, one equipped with satellite TV, the other to the Tunisian and a dining room. Local art is present in the villa through tables generously color walls. The kitchen, decorated green tone, is fully equipped and gives you access to the terrace with a view of trees. The room blue colored bathroom has a bathtub. The rooms are equipped with venetian blinds to choose the intensity of the light. The two rooms are equipped with storage (for a wall cabinet and outdoor cabinet for the other). One of the rooms has a small sitting area, for moments of reading.The living room is lit by spotlights as a starry sky.Everything is close, no need car: the well-stocked grocer, always a smile, sandwich-pizzeria owner and attentive to your needs. The house was very clean and within walking distance to shops, beach, and restaurants. The owner was very welcoming and very helpful. He was there whenever we needed information or things in the house. one thing I have to admit i ate lots of raspberries from the big tree leaning on our balcony. cozy, clean, and friendly place. I plan to go back if available soon. In a very good location close to all amenities. Owner very friendly. Called to home a couple of times to check all was going well. I called owner once in my stay as the tv channels were not working. Owner came within minutes and fixed the problem. Will I return to the property. Yes definitely. I would recommend this property 100%. "The Villa is very well located close to local shops and a little taxi trip for half a dinarto the Medina was excellent where there are a host of cafes and restaurants and an excellent beach and promenade. I found the accommodation to be very comfortable, clean and tidy I had the added luxury of a private sun roof. The owner Ishmail and his lovely wife were very helpful and as it was my first trip to Tunisia the pick up and drop off service offered by Ishmail from and to the airport was very welcomed by me." 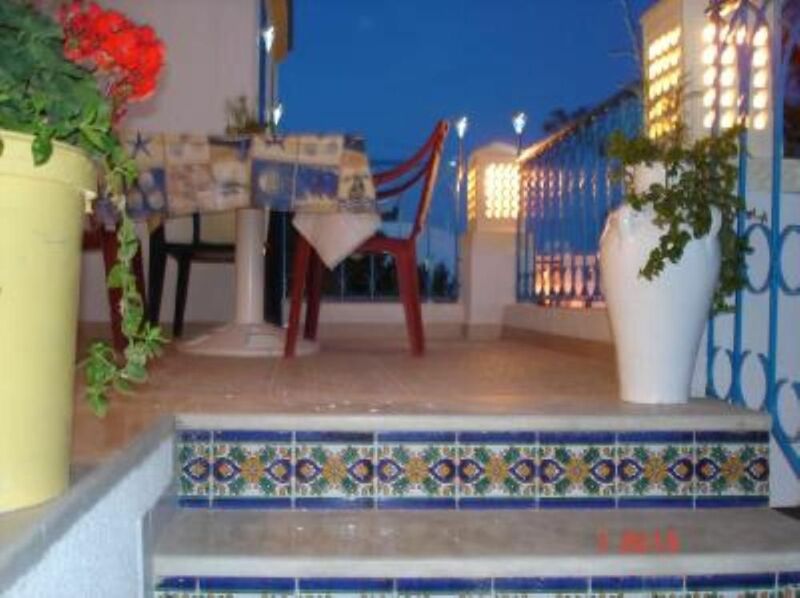 "This was a nice apartment which was very central and close to shops, cafes etc and taxis which ran back and forward to the Medina and beach. The apartment was comfortable and clean and I enjoyed the private sunroof which this apartment offered. It was quiet and I felt peaceful. Ismail was at hand and very helpful if there were any problems to be solved and I appreciated the pick up and drop off at the airport as it had been my first time in Tunisia. I would definitely go back again." "We really enjoyed our stay at Dar Zohra El Pacha Hammamet. The apartment was located in Hammamet Nord which was ideal because it was away from the expense and crowds of the Centre. The apartment had all the usual amenities and Fehri was always on hand and friendly i.e. a perfect host. Fehri professionally sorted out our airport transfers, excursion trips, etc. All in all we had really good holiday and stay! Mr I collected us from the airport and from that time until we went home he was the most friendly helpful person, his family also lovely and welcoming. the appartment was spotless and very spacious, we know Hammamet as my daughter lived there for 8yrs and the situation was ideal just off the main road near taxis and supermarket. 5 mins walk to hotels and restaurant. 5 mins in taxi to Hammamet centre all in all was a lovely holiday and will be well reccomended. (Text automatically translated) Dar Zohra is located near the center of Hammamet. Hammamet North take exit from the highway. An access guide will be provided upon booking. An airport-villa-airport transfers are available on request. (Text automatically translated) Sidi coffee Bouhdid Medina is located within walking distance from the house in about 25 minutes. This is a magical place to enjoy a tea gear at sunset while listening to the music of Hum Kaltoum or Fairuz. Adjacent is the market must to taste the fruits of the earth, without pesticides. Yasmine Hammamet, balnéraire modern city worth visiting taxi to take you home. Nabeul and its Friday market (amarché camel) is also only 10 minutes by taxi. We are at your disposal to offer you other circuits.